Manoharan and Amudha are a simple, middle-class couple. For 19 years of their marriage, the couple has been trying to have a child to complete their family. Finally, with the help of IVF, they have been blessed with twin daughters. Unfortunately, their joy did not last very long. The babies were delivered pre-term, and were extremely critical at birth itself. 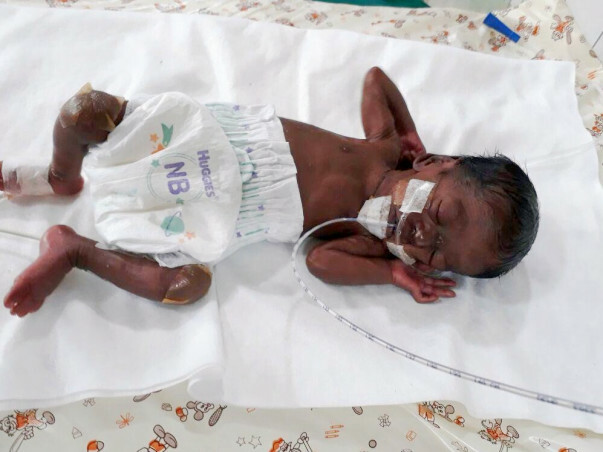 Manoharan and Amudha have waited 19 years to have a baby. Married almost 20 years ago, the couple have been trying to have a baby for the past 19 years. Amudha thought she had lost her children at the end of the 6th month. Amudha was finally carrying her children. Her life felt complete after the long period of hopelessness. Soon, she found out she was carrying twins. However, at the end of the sixth month of pregnancy, Amudha had an episode of profuse bleeding. Amudha had to undergo a pre-term delivery. She had been blessed with twin daughters. The babies have been critical since birth, weighing under a kg each. Mnoharan has spent over 7 Lakh to give his babies the life-saving support that has kept them alive so far. They are still one step away from becoming stable and would need intensive medical care for another month. Manoharan has no money left to fund this care any further. With your support, Amudha can hold her own babies in her arms! Thank you for all the love and support you have shown Amudha twins. They are doing beautifully well. They are growing healthy and achieving milestones. Thank you for the great support and blessings. Will keep you posted. 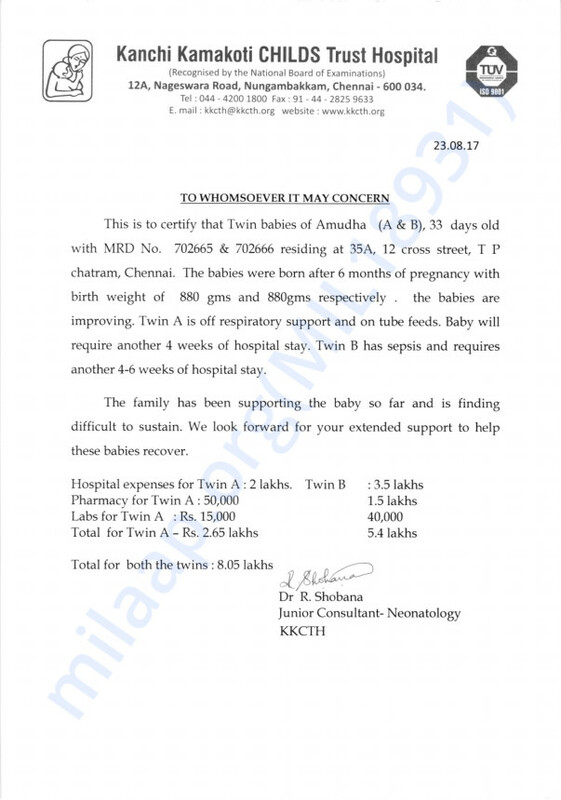 Good news on Amudha's twin babies. The first twin baby is getting discharged today and the second twin got discharged four days ago. Both the babies are doing well and have grown from 800 grams to ~1.4 kgs now.